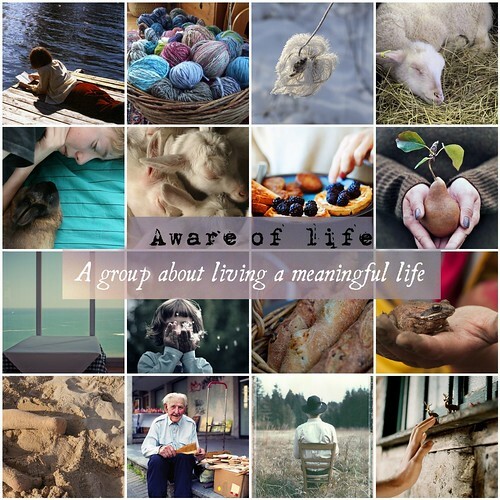 I am so fond of my new Flickr Group "Aware of life". It's a a group about living life on purpose, celebrating the seasons, making and eating "slow food", getting your hands into the soil, raising kids with mindfullness, listen to nature, greeting life's ups and downs, experiencing that the earth is our Mother, being aware of who you are, seeing the beauty in small things, treasuring the silent moments, being grateful for what you've got. I just want to show, that there is another kind of life, something most of us long for and there are people who are living it, even if it's only in small moments. It's an invitation to look beyond the shallow beauty of glossy magazines and TV shows, big noisy cities and the inexorably ticking of the clocks, that keep telling us: "You'll never make it...you'll never make it." Sometimes people tell me, that my photos show a kind of fairytale world, far from reality, looks like there are no problems....etc.. That's not true. My life is not so easy. But one thing is true: I am aware of life. I live in a calm and peaceful surrounding. I am trying to keep my ecological footsprint small. I am trying to teach my daughter to have reference for life and to see the beauty in small things. I think now with the changes of 2012 it gets more and more important to take a deep breath and ask yourself: is this life I am living really what comes from the bottom of my heart? If you are on Flickr, just come over and join us! It's so encouraging to see how awareness is growing more and more at this time.Thanks for sharing these beautiful pictures.Have a peaceful day. A great post. I can get so caught up in a great feeling of rush, rush after just a brief time on the computer, and then I see these photos, and they speak to a calm and wholesome lifestyle that just CALLS to me. Thank you for putting the Flickr group together! Hi Lawenduala, Just found your lovely blog and decided to follow you. I'm Sandra and living in the Netherlands.